B-Dama fires up the grill on Piedmont Avenue, plus a guide to celebrating Chez Panisse's fortieth without going broke. Owners of Geta, the kiosk-size sushi bar just off Piedmont Avenue, opened the doors to their izakaya last month. B-Dama is in the old Messob Ethopian space at 4301A Piedmont Avenue, the block Adesso anchors. B-Dama (Japanese for "marble," as in the kids' toy) offers a few Geta-style maki and other sushi bones tossed to non-izakaya diners. 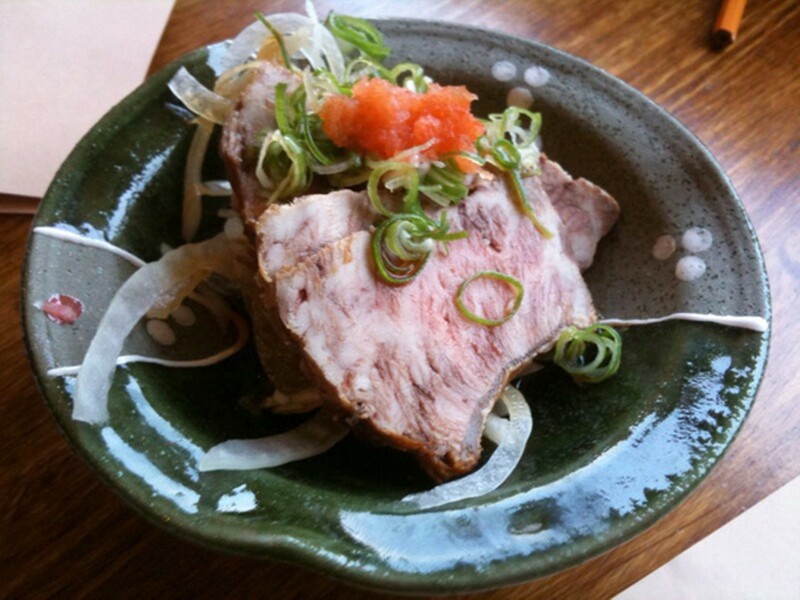 But the heart of the menu is kushiyaki, skewered and grilled meats and vegetables. You order via paper checklist and mini pencil. I stopped in last week for a first taste — negima, bits of moist, plush chicken breast with lengths of scallion; momo, chicken thigh; butabara, chewy squares of pork belly; and crisp, nearly raw shishito peppers. You specify whether you want them salted, or sauced with soy and mirin. The kitchen happened to be out of hatsu, chicken heart. The yakitori has pretty good credentials (the kitchen sources Petaluma Poultry's Rocky Jr. and organic Rosie birds), there's a fairly short but nicely rounded beer and sake menu, plus Sapporo on tap, available by the pitcher. Also: a supplementary food menu with lots of potential for exploration, including nimono (braised dishes) of beef tongue and tendon, a cold beef tongue aemono with red miso, and half a dozen sunomono, vinegared bits ranging from boiled chicken to deep-fried pork. I tried that last one, actually, called butananban. It turned out to be a carefully fanned pile of tangy, escabeche-like pork slices (from the loin, I think), with a subtly flocked texture from the breading. A dish the kitchen sent out as a little gift turned out to be the best of the night: beef tataki, cold, finely marbled slices that seemed to be from the shin, arranged over a little pile of sliced white onion, leached of heat and dressed with soy and vinegar. It was a promising taste of sake-soaked meals to come, once B-Dama gets fully on its feet. Nobody does big and sprawling like Alice Waters. In 2008, Waters set in motion Slow Food Nation, which lurched to life like a complex, multigeared machine wielding multiple moving arms. Exactly three years later, the wheels are grinding again. To mark the fortieth anniversary of the first meal served at Chez Panisse, on August 28, 1971 (checkered oilcloth, pâté, duck with olives), Waters' Chez Panisse Foundation has wound up a series of dinners, parties, film screenings, a book release, and an all-day conceptual happening at the Berkeley Art Museum. Most events are fund-raisers for various initiatives in edible education (a pursuit so dear to Waters that this fall, the Chez Panisse Foundation will morph into The Edible Schoolyard Project). And though the list of events taking place on the weekend of August 26-28 is confusing, there are three basic things you should know. First: You can't afford any of the big marquee dinners, so it doesn't matter that most are already sold out. For the various dinners tagged Chez Panisse Chez Soi, where cooks and others with a connection to the restaurant serve it up in private homes, per-person admission ranges from half your monthly rent ($500) to the last chunk of credit limit on your last good Visa card ($2,000). Net result: You will not be joining the investment bankers and biotech COOs eating from the pig roasted in Michael Pollan's North Berkeley backyard (cost: $1,000 per person). Sorry, you just won't. And third: The awesomely capable Samin Nosrat (Bakesale for Japan, Pop-Up General Store) is coordinating Eating for Education, a list of restaurant benefit dinners and food sales offered nationally on August 27, including ones you could actually afford (coffee at Blue Bottle and Four Barrel, ice cream at Ici, tacos at Xolo and Tacubaya, a sit-down dinner at Cosecha, etc.). Scan the full list at the Eating for Education web site (EatingforEducation.org). Oh, and one more thing. If you'd just rather enter through the gift shop, Clarkson Potter is releasing an anniversary tribute volume, Forty Years of Chez Panisse: The Power of Gathering ($55, goes on sale August 23), which begins in 1964 with the Berkeley Free Speech Movement and pretty much ends with Slow Food Nation, which looks a hell of a lot less complex on the page than it was to experience, with a taste of what made it so impressive.